"It's very rare when a new band comes along that gets me excited, REAL excited. I'm talking falling-off-the-edge-of-my-seat excited. Sure, quite often I discover and enjoy good music by new groups that have great timing, rhythm and groove, clever arrangements, tight harmony, tasty notes. But for me to experience music euphoria, it takes something that transcends all of the above. I'm not always sure of what it is, but I recognize "it" very quickly when it happens. When I go to a show and from the first note from the band everyone in the audience is smiling, can't sit still, is swaying to the music, dancing in their seats, or even standing up to dance because they can't help it, then I know the band has "it." I had seen and heard Brad, Patrick, Sean, and Alex individually in other music entities over the years and in each situation, they captured my attention as amazing musicians to keep watching for. Each one of them is a head-turning musician on his own. 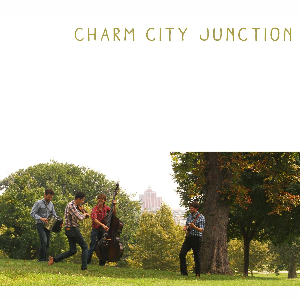 So when I heard they had formed a new group, Charm City Junction, I just knew that this could very well be one of those rare aligning-of-the-stars moments. I didn't hesitate and went to see them in concert. Sure enough, BAM! From the first note to the last, the audience was captured with powerful, driving, pulsing, can't-keep-still rhythm. Alex, Sean, Patrick, and Brad couldn't help but let it show that they were having as much fun as the audience. They were smiling and moving as well. Everything about that night was spectacular, the energy, the pacing of the set, the variety of material. On the way home, I told my friend who had joined me, "This is the band I'd like to be in!" Ian Stephenson, a guitarist from England, composed this tune upon arriving home after studying at the Sibelius Academy of Folk Music to find his parents had sold the house he had grown up in. We learned this tune from the playing of the band Frigg.